I’m always interested in methods for hanging draperies which may not be as obvious as they look. 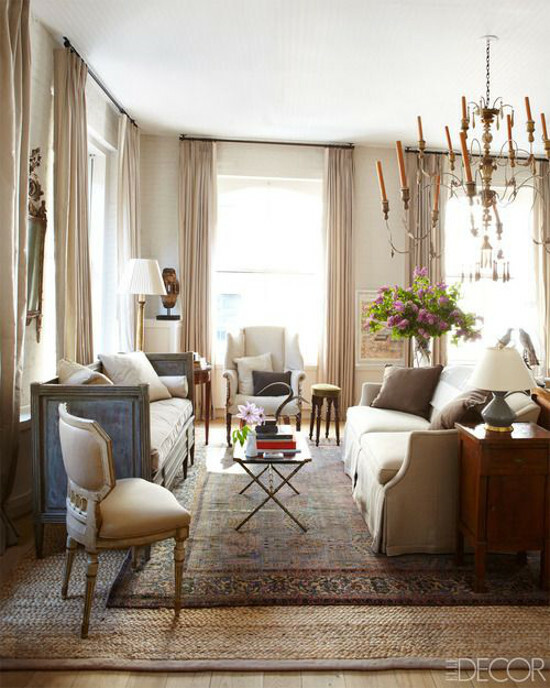 By strategies, I mean how hanging draperies relates to the windows and ceiling in any room. Additionally, I take an interest in the choice of rods used for hanging draperies because rods are the supporting actors. One thing most people don’t realize is that draperies are deceptively heavy. Additionally, drapery hardware may add to the weight. For draperies to look great, it’s essential to get hardware properly placed and securely installed. That’s why I like to spend a time looking at draperies and checking out refinements that add to their beauty. 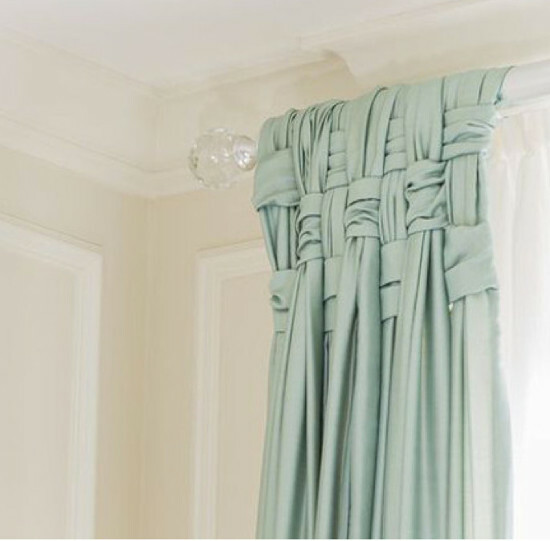 Whether custom or ready made, draperies are expensive and can transform a room. Among professionals, there are general guidelines for installing draperies but even those can vary according to the needs of a room or the preference of the homeowner. Then there are questions of taste. Gorgeous to one eye is ‘what were they thinking?’ to someone else. But I expect any negative reaction is most often pinned on fabric choice. White and brown lantern-print fabric is beautifully worked in bedroom draperies [top]. When they are stacked back, the pleats show the lantern image — a mark of a professional drapery workroom and a lovely refinement. Most interesting to me is the molding added above each window with its own crown on top. That raises the height of the ceiling and acts as a frame of sorts for the draperies. They are hung on white-painted wood rods with white rings. Both rods and rings blend into the molding and the crown adds a lovely finishing touch. On the floor, the draperies lean rather than puddle. Large-scale print draperies can be a challenge but these look perfect to me. St. Louis designer Amy Studebaker designed graceful white draperies to frame a floor-to-ceiling foyer window. This window also has interesting top molding — a tudor arch. Additionally, the ceiling has elaborate the elegant crown molding with dentil details. Rather than fight the arch, Studebaker chose brass drapery rods and placed them right at the base of the ceiling molding. That way the center support for the curtains was well above the arch and barely noticeable. 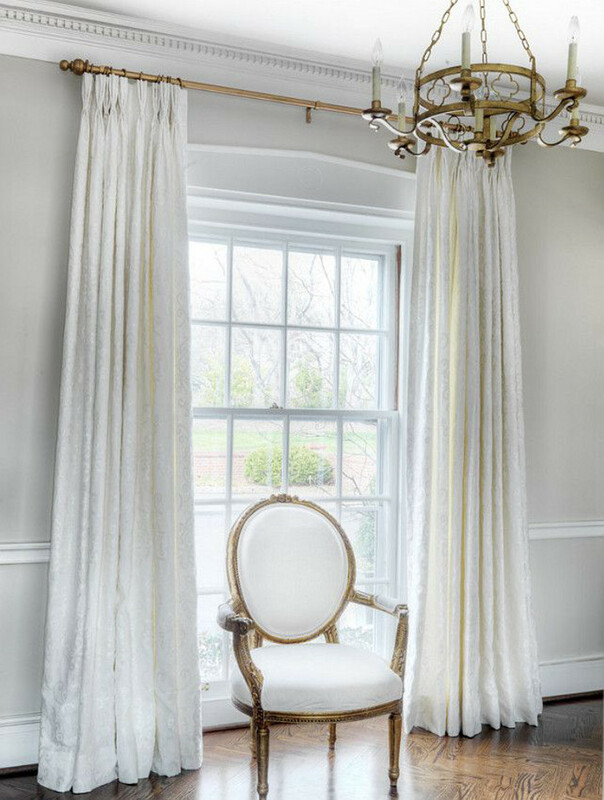 Coordinating the look of the drapery rod with the chandelier and the gilded fauteuil is a deft move that adds welcome metallic luster to the pale wall. Beautiful old-home features like wall moldings and cove ceilings can complicate draperies. In a Boston townhouse, designer Leslie Fine finessed that by painting the walls and molding tone-on-tone ivory and cream. Then, a single accent color — a pale green — was used for the draperies to call attention to the beautiful tall windows at the end of the room. The color was repeated in for accents on pillows and upholstery. These draperies have a wonderful fullness that makes them stand out on the bottom and puddle slightly. They are beautifully hung on thick white rods with silver and glass ball finials just below the cove molding. The panels are designed to be stationary. The tops are gorgeous — done with a beautiful basketweave effect that reminds me of evening gown detailing. This close up is great to see how narrow the panels actually are and how color is used to maximum effect in the room. Pleated curtains look slim when they are below the custom standard of two-and-one half times fullness. That’s often the case even with the nicest ready-made, lined draperies. They somehow lack a billowy look. The taupe panels in this elegant room certainly are custom but they are pin straight. That gives them a tailored, masculine look. Hung from rods anchored directly onto the ceiling, they help maximize the window height. I’m sometimes not enamored of what I call “wall gap” — the foot of wall space that shows between the top of the windows and the ceiling. But here, with panels tightly stacked back and not too full, the wall gap is barely noticeable. Designer John Saladino likes to recess the top of draperies on tracks in a channel around the ceiling. No surface mounting for him. That calls for planning in the architectural design and construction of the space but the high end homes Saladino designs support that. For me, recessing the tops makes the draperies look integral with the room vs layered. In the case of this dining room, curtains help soften the wood paneling and they permits the space to be closed off. No cracks about hospital rooms, please.